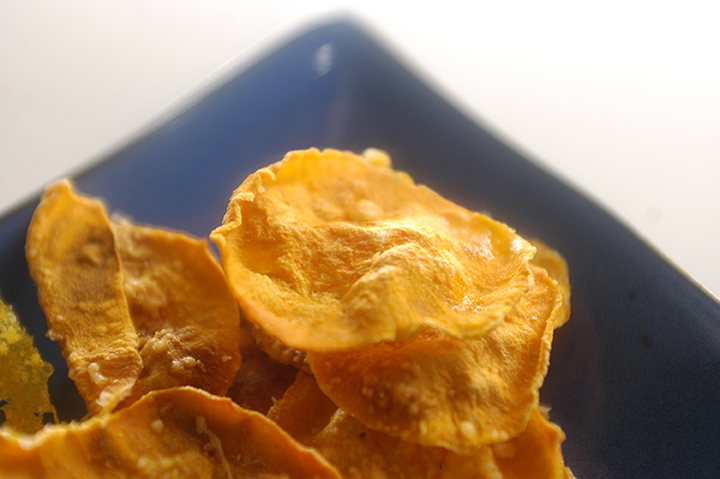 I have been addicted to these microwave sweet potato chips recently! Why? Because they taste great (obviously), AND they are sooo easy to make! I’ve been keeping a peeled sweet potato in the refrigerator. When I want to have some fresh chips at lunch time, I just slice thin rounds with my mandolin, place on a parchment lined plate, season with parmesan and onion powder, and zap in the oven for three to four minutes. How easy is that? 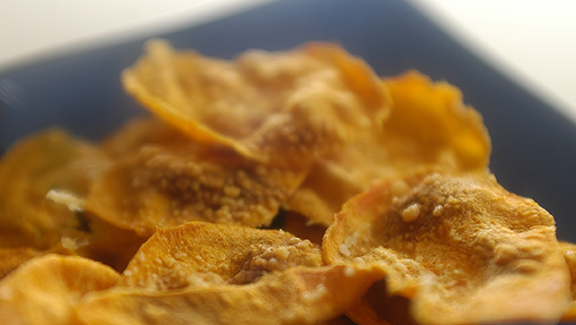 I was inspired by this recipe for sour cream chips. I couldn’t find powdered buttermilk, so I just omitted it. I also omitted the salt, which I found unnecessary. I was dubious at first – -I have always made chips in the oven. But invariably they would burn on the edges. 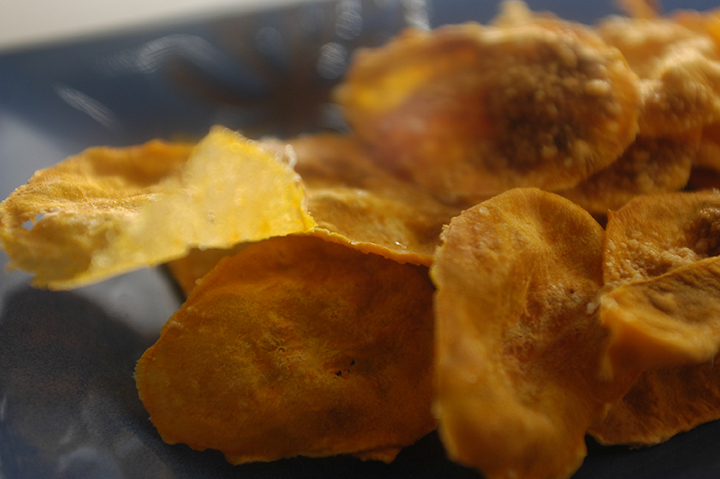 I thought microwaving these would produce soggy chips — and they did, the first time. The trick is to slice them REALLY thin, and you need a mandolin to do this. Line a plate with parchment paper. Spray with non-stick spray. 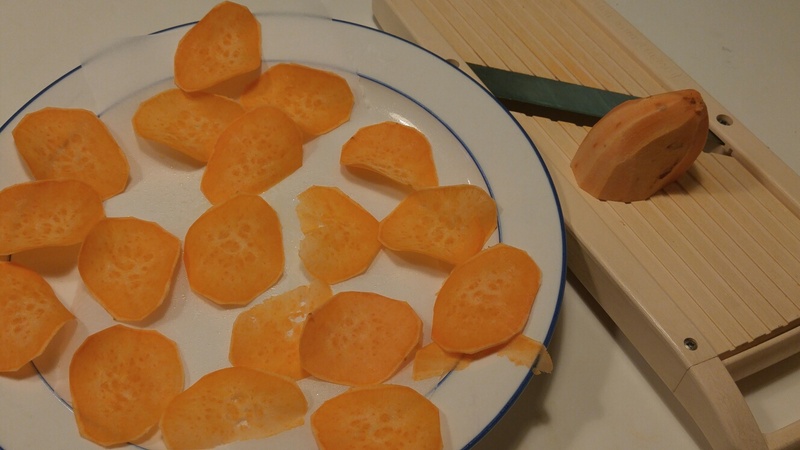 Slice some thin rounds of sweet potato with a mandolin. Arrange in one layer on parchment. Spray with non-stick spray. Sprinkle with parmesan cheese and onion powder. Microwave on high for about four minutes checking to see if they are getting too brown at about three minutes. Remove and eat! If you want to make a bigger batch and save in an air tight container for later, just repeat the process until you finish slicing the sweet potato. 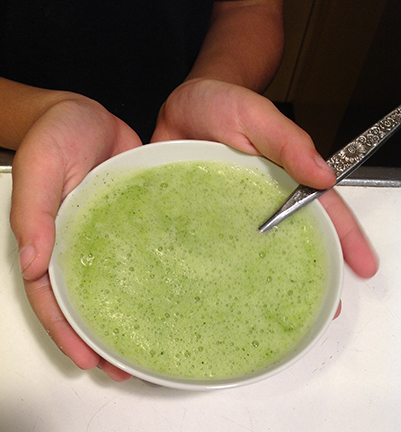 I did a similar soup post way back when when I created this creamy green soup. This one, however, is even easier, and I recently taught my ten year old to make it by himself! 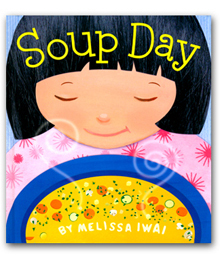 It is his favorite soup these days, so I make it a lot. And now he can do the honors. 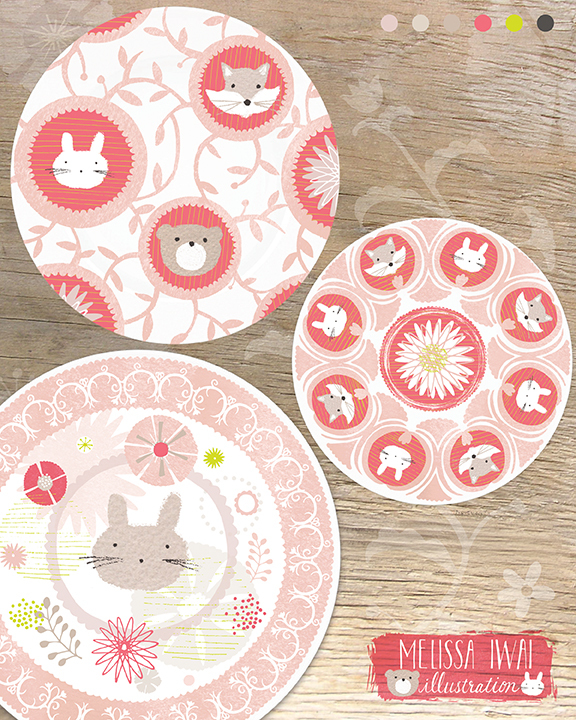 This is a good thing because I am so busy these days with MATS A and other work! 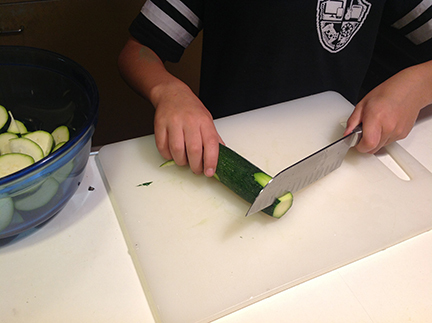 All you do is cut 2 large zucchini into slices. Then you steam them in the microwave for about 6-8 minutes. Place steamed zucchini into a Vitamix along with 2 cups of broth and season with some salt and pepper if you like. Blend and serve! If you want it warmer, just heat it a little for about 30 seconds. 1. Cut zucchini into slices. Place in large bowl and cover with saran. Microwave for about 5-7 minutes until soft (it depends on your oven). Alternatively, you can steam in a steamer on the stove for 8-10 minutes. 2. Blend cooked zucchini and broth and seasonings in a Vitamix or blender until smooth. Makes about 4 large bowls of soup. I know I sound like a broken record, but I’m still crazy busy and haven’t had time to cook or bake anything very exciting! Unfortunately since I’ve been working on client work, rather than personal pieces, I can’t show anything (until it’s published). 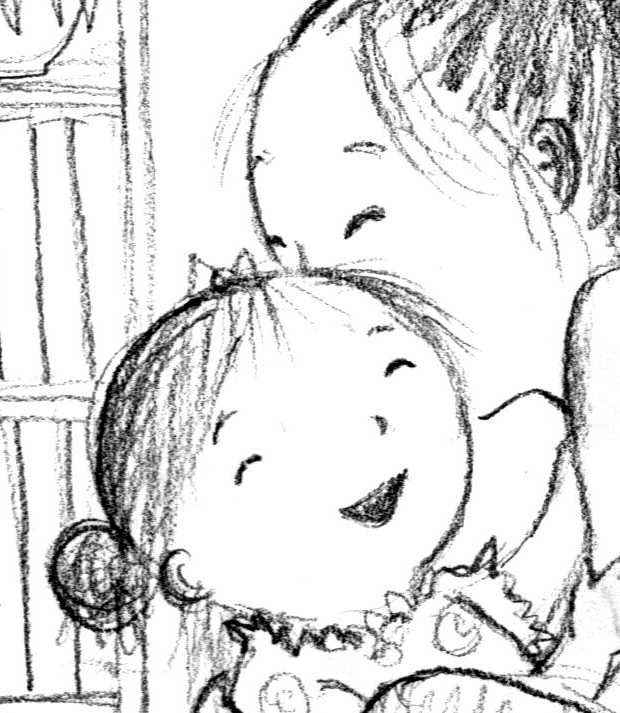 Here’s a peek at a sketch I did that will appear as part of a story in Highlight’s magazine for babies, Hello! I also did the cover for that issue. 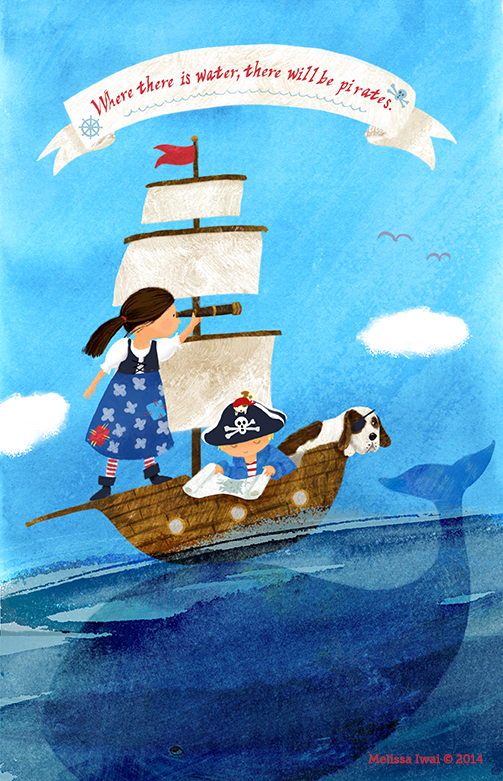 I had a lot of fun painting this little one and her mom! 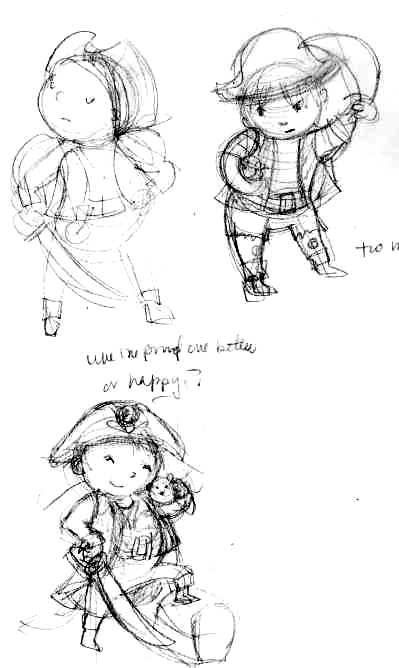 I’m also working on another Hidden Picture for a Let’s Play Hidden Pictures book, and working another Anne Rockwell story as well as several other projects. I’ve also been (quickly) experimenting with cauliflower flat bread (see my previous version here) and chia pudding in my attempt to eat more whole foods even in the midst of stress and work. I’ll post more on that later! 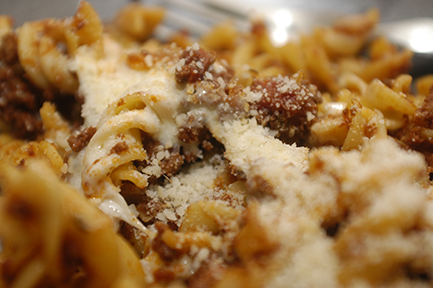 In the meantime, enjoy this easy, fast, and delicious beef pasta dish! 1. Put beef through red wine into slow cooker. Cook on low for about six hours, stirring every two hours or so. 2. Preheat oven to 350 degrees F. Cook pasta according to package instructions. Drain. 3. 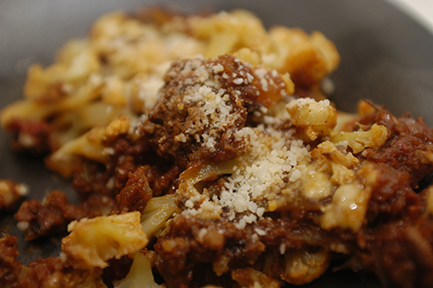 Return cooked pasta to pot and pour in beef sauce and grated parmesan. Mix thoroughly. 4. 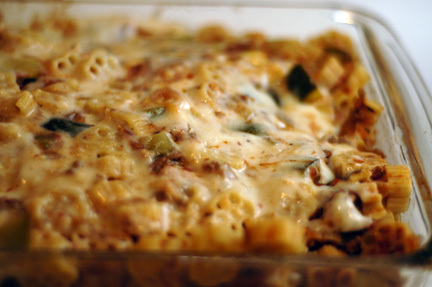 Pour pasta mixture into a casserole dish and sprinkle with shredded cheese. Bake in oven until cheese is melted, about 10 minutes. 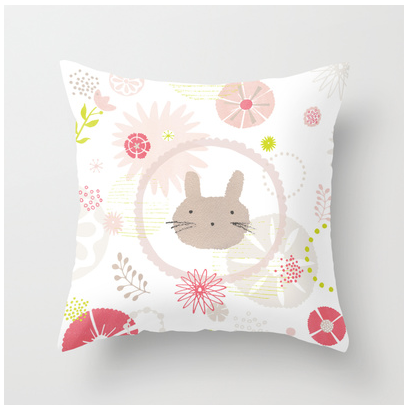 This is the one I decided to work with. 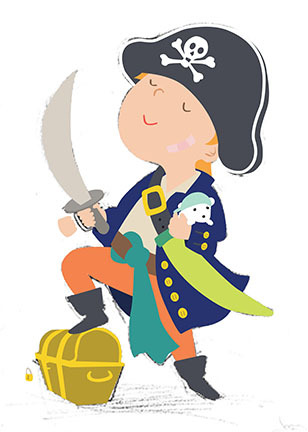 This is my pirate after I drew every shape in Illustrator. it was WAY tedious! 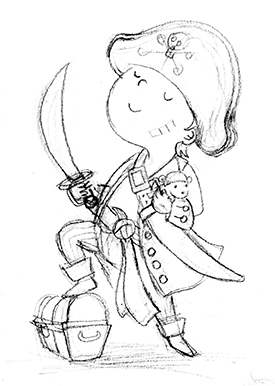 This is the pirate after rendering it in Photoshop — a realm I am a lot more comfortable in! 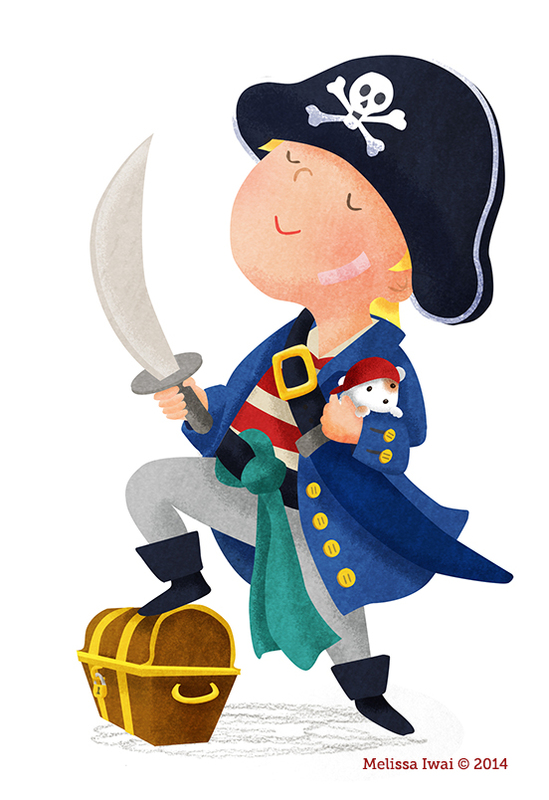 This is a full illustration incorporating the character. 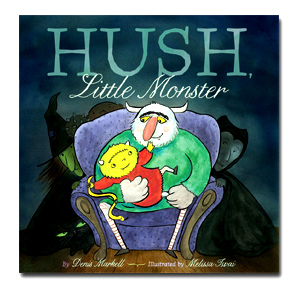 I will use this as a promotional piece with my artist rep. I used a lot of techniques I learned in the Skillshare class, so I’m really happy I took the class! With these various projects going on, the slow cooker has been my friend. 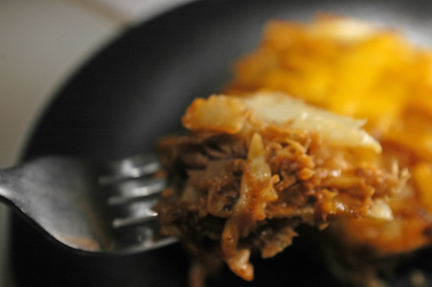 Our favorite dish is Slow Cooker Pulled Pork. It’s so great to throw everything in the cooker and forget about it. In 6-8 hours, you’ll have tender, tasty meat. I tend to avoid chicken in the slow cooker, unless it’s dark meat though. White meat tends to dry out. 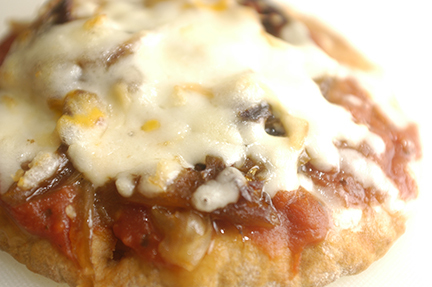 Recently, I knew I wanted to saute some onions for easy Mini Pizzas I was planning for a quickie dinner. That morning, I had the brainstorm of throwing some sliced onions in the slow cooker and letting it cook all afternoon while I was out. That cut down on about 20 minutes of sauteing later in the evening– 20 minutes of precious time I could be working! I just used one onion and drizzled it with some olive oil. It cooked on low for 4 hours. But next time, I will buy a bag of onions and a bunch at one time. This might take closer to 6 hours to cook. 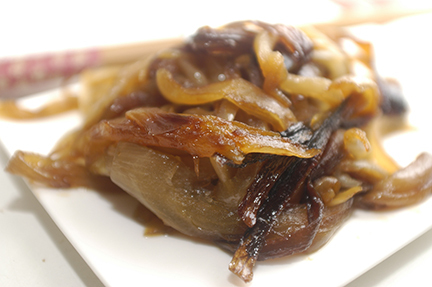 You end up with soft, sweet, meltingly tender onions. They can be store in the refrigerator and used throughout the week in omelets, fritattas, quesadillas, burritos… I’ve even put them on my salads. They are soo good! 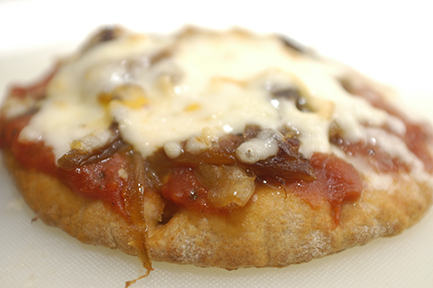 For this batch, though, I put them on our mini pizzas for a FAST week night meal! 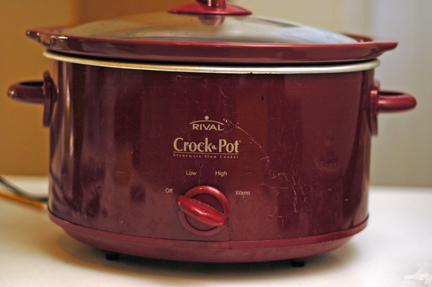 How about you all– what are some slow cooker recipes you can’t live without that make life easier? 1. 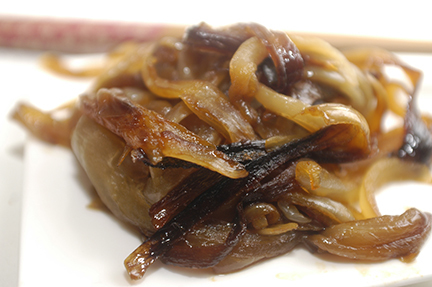 Put sliced onions in slow cooker and drizzle with olive oil. Season with salt. Stir. 2. Cook on low for about 4-6 hours. Any other topping you would like! 1. Preheat oven to 400 degrees F (I use our toaster oven). 2. Spoon some sauce on each of the pitas. Top with toppings. 3. Cook in oven about 8-10 minutes depending on how crunchy you like it (place directly on rack). Imagine this: It’s a weeknight and you need to make dinner fast. Instead of take out (which actually takes some time because you have to order and then go pick it up or wait for it to be delivered), make this! I used leftover slow cooker pork shoulder, but you could easily use shredded rotisserie chicken instead. I was inspired by this recipe from Cooking Light. Instead of seasoned ground beef, I used pre-cooked pork, and instead of the enchilada sauce, I got really lazy and used bottled barbecue sauce. 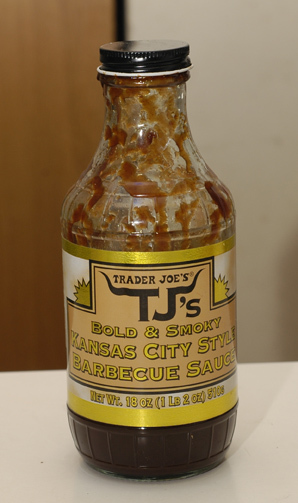 We love Trader Joe’s Bold and Smoky Kansas City Style Barbecue Sauce. It’s tangy and tasty, but not spicy (for the little one). Saute some onions, and mix in the pork or chicken and the barbecue sauce. Add a handful of cheese. 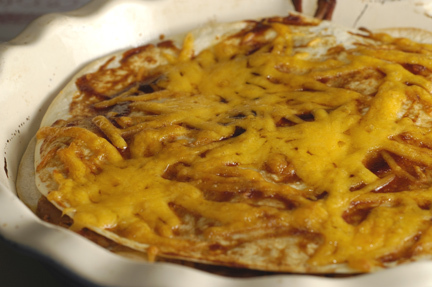 Layer mixture in pie pan with flour tortillas. 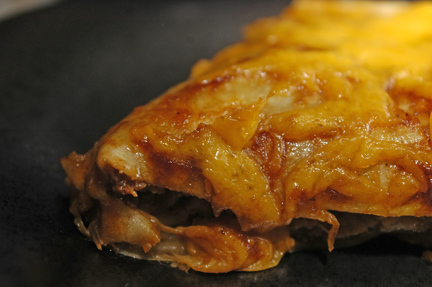 Top with a bit more sauce and cheese and bake until melted. Easy peasy! Preheat oven to 400 degrees. Spray a pie dish with spray. Set aside. Sauté onion with oil in a large pan until soft. Add pork and 1/3 cup of the barbecue sauce. Stir together to combine and sauté gently until heated through. Stir in a handful of the grated cheese, and remove pan from heat and set aside. Place one tortilla in pie dish. Spread 1/3 of pork mixture on top. I divide the mixture in the pan first by making a “peace” sign with three equal portions, so I have a clear idea of what 1/3 of the total is. Cover with another flour tortilla. Continue to layer with another 1/3 of pork mixture, another tortilla, and last 1/3 of pork mixture. Cover with last tortilla. Spread rest of barbecue sauce on top layer. Sprinkle with grated cheese. Bake in oven for about 10 minutes until cheese melts. Cut into wedges and serve. Here is an easy weeknight dish that accomplishes that, and even meat eaters will approve. From a health standpoint, eating less saturated fats and more healthy fats from plants is always a good thing. From an environmental standpoint, eating less meat and more plants is also a good thing. From your pocket book’s standpoint, it is a lot cheaper to maintain a diet heavier on plants (especially if you grow a lot of them–something I, unfortunately, haven’t had to luck of doing) rather than on meats. My husband is a meat person — I’ve mentioned before he only used to eat brown food (think bacon, beef, chicken, potatoes, peanut butter, bread, etc.) for a lot of his life before we got together! 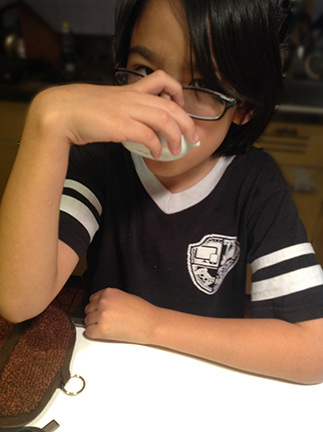 I’m not going to force him to become a vegetarian — it would never work anyway. And I eat meat also — just not so much red meat. This is a simple, fast weeknight dish that you can adapt to suit your preference. If you like more meat, add more. No meat, omit it. You can swap ground turkey or chicken for the beef. Use whatever vegetable you like. Since zucchini is a family favorite, I use it. But I think this dish would also be great with eggplant, mushrooms, peppers, even fall friendly vegetables like butternut or acorn squash. The more variety of colors, the better! Just be sure to cut the pieces into similar sizes. 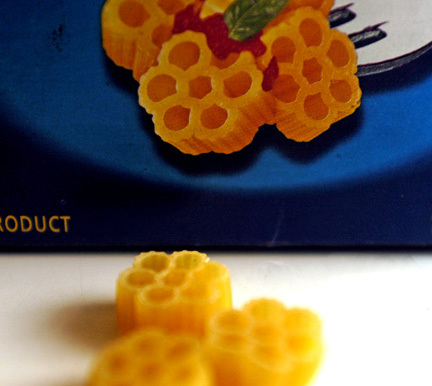 Fiori pasta is so cute. I used Fiori pasta because I had a package in the pantry, but any bite sized pasta would work well. Make a meat and vegetable sauce. 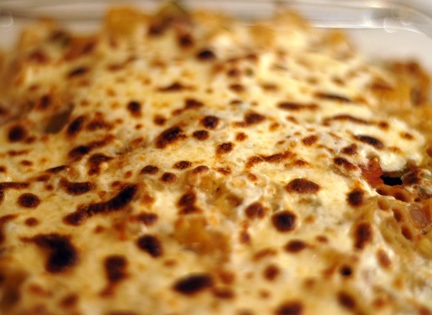 Make a Béchamel sauce if you’d like an extra layer of flavor and richness. 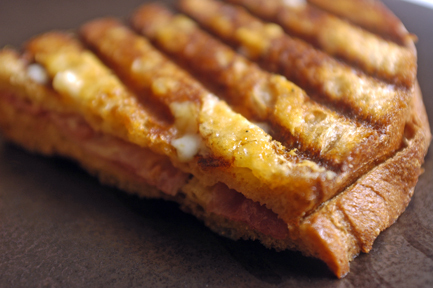 Top with mozzarella — note: Freeze the mozzarella about 30-60 minutes before grating, so it is easier to grate! Spotted from some broiler action. 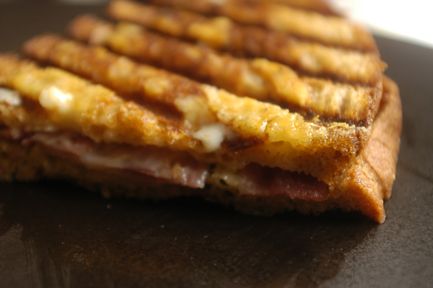 Throw in the broiler for a quick melt and you’re done! Bring large pot of water to boil. Season with salt. While waiting for water to boil, put mozzarella in freezer to firm up. 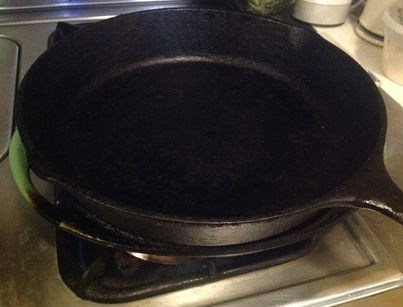 Heat oil in a large skillet or pot over medium heat. Sauté onions and beef until beef is no longer pink. Add garlic and let cook until fragrant. Add zucchini or other vegetable. Sauté until softened slightly. Add canned tomatoes. 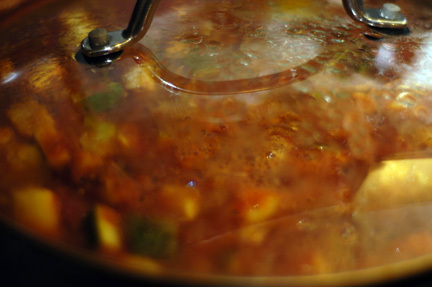 Turn heat down to low, cover, and let simmer, stirring occasionally until vegetables are soft, about 20 minutes. 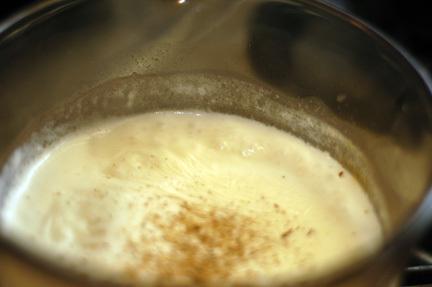 If using, make béchamel sauce. Melt butter in a small saucepan. Add flour and quickly whisk with butter to prevent from clumping. Sauté for a minute. Gradually add a little bit of milk while whisking. Don’t add it too fast, or the sauce will become lumpy. Add just enough at a time to smooth it out. When it is the consistency of a smooth, liquid paste, add the rest of milk, while whisking. Season with salt, pepper and grated nutmeg to taste. Let simmer and thicken about five minutes. Meanwhile cook pasta al dente according to package instructions. Set aside. Preheat broiler. Coat the bottom of a 13 x 9 inch baking dish with spray or olive oil. Set aside. 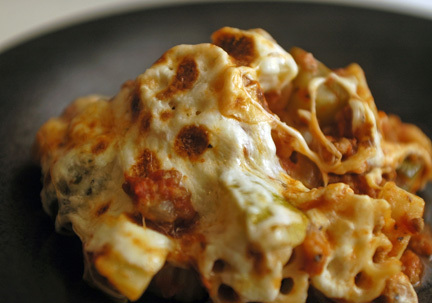 Assemble baked pasta. Combine cooked pasta and cooked sauce in the large pot you used to cook the pasta in. Add grated parmesan. Stir to combine. Transfer to baking dish. Top with a layer of béchamel sauce. Cover with grated mozzarella. Broil in oven until cheese is melted and is starting to brown, about 2-3 minutes.